Tiffany Sinn is an agent of the CIA. Eventually, she is. When we first meet her, she is a private investigator who will get mixed up in a case involving Rex Swift from the CIA. Later she would change jobs and become a full-time agent herself. Sinn wears her dark hair in a very stylish short pixie cut which not only looked great on her but also had to have been useful by not getting in the way in an altercation. She dressed well but practical although climbing stone walls in a skirt had to have been hard on the knees. She shows several times that she can handle herself, especially when the shooting starts. Her soon-to-be-fiancée, Swift, must agree because at the end of the first adventure, after she had come along to save him, chimed, "I'm gonna marry you and put an apron on you! You're too dangerous with a gun!" While Sinn not only does not take exception at that sexist remark, she agrees to get married but in the second recorded adventure, she finds herself in the arms of a different agent and even as she remembers her fiancée, she does not object to the smooching showing she is definitely her own person and able to do what she wants. 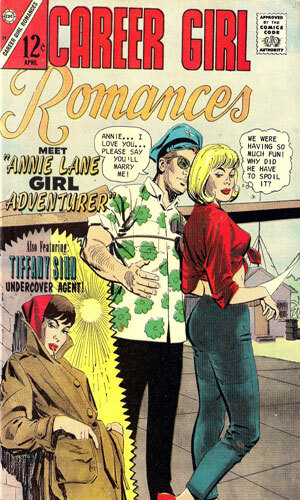 Tiffany Sinn made her initial appearance as a second story in Career Girl Romances in February 1967 and showed up again the next issue in April of that year. 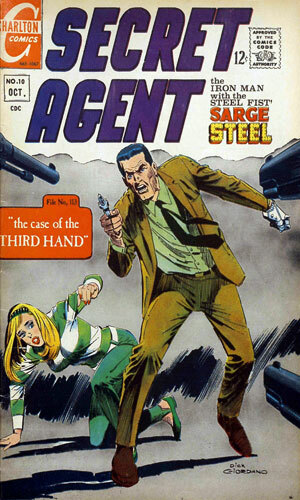 She then hid out for a year and a half before having her final adventure in October 1968 in the back pages of Secret Agent comic. Note: the incredible Thrilling Detective website provided a lot of the information found here. What an awesome site that is. From the pages of Career Girl Romances #37 - Tiffany Sinn is actually kidnapped by CIA agents to take her to meet a bigwig in the Agency who wants her help rescuing an agent kidnapped in East Berlin. When she learns the man in trouble is the same guy who rescued her over a decade before, she readily agrees. The second mission starts quite like the first when Tiffany Sinn is kidnapped by the CIA for another job, this one to find Rex Swift's younger brother, Alfred, suspected of being a member of the Nazi Party (in 1967). Sinn's job is to find him in St. Louis and "dispose of him". Note: this was obviously a two-part story with the conclusion promised in the next issue but never produced. The ending, though, was told in a short flash-back in the third and final adventure. After recapping the first two adventures, Tiffany Sinn is sent to California where she must go undercover at a chemical research facility where secrets are being stolen and she must find out how and who. I look through all sorts of comic books from the 40s-70s for spy series that have gotten lost in time. 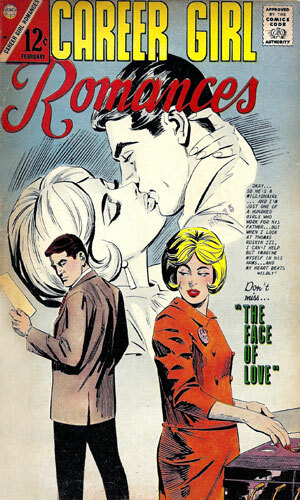 I never thought to check romance comics and I should have. Apparently from the many different entries I subsequently found on the web, a lot of other people had not been so errant because for a short, 3-issue non-headliner series, there are a fair number of mentions to her, all of which I missed. Oh, well! Once I found her, I was really taken back to my teenage days. Not reading romance comics, of course (okay, I sneaked more than an occasional peek at my older sister's comics), but the hair and clothing styles sure took me back. So did comments in the stories like calling a communist "redski" and having one of them folks spit out a "capitalist swine". Ah, yes, the good old days. Still, in these days of oligarchs, Russian mafiya, and voting hackings, maybe not that much has changed. These were decent stories, considering they were second-stringers. At least Tiffany Sinn got a cover spot on the second issue, complete with a trench coat.